Hello Everyone ! I hope you are having an amazing summer. We have been doing pretty good and enjoying the nice weather. The kids have finished swimming lessons and my husband is now on holidays for two weeks. So summer for us is now in full swing. At the end of May I got a new camera to take better blog pictures and to start my YouTube channel. This has now really peeked my interest in photography. I had to learn how to use it and memorize all the buttons and how many times to push them to get to where I wanted to go. It has been a lot of fun. I have really enjoyed taking pictures even though I can not see them, it has really been fun learning and just relaxing doing something new. It may seem weird that I have been enjoying photography since I can not see but I have never taken my blindness into consideration when I want to try something, so I figured that there was no need to consider it now. I am aware of my surroundings, so I will touch Rick or whatever I am taking a picture of and back up and then shoot away. I take a whole bunch of photos and then I get my husband to check them out and see which ones have turned out good. I have really enjoyed learning something new and finding a new hobby. 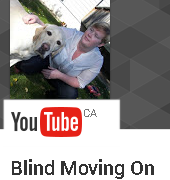 Along with taking pictures I have enjoyed making videos and sharing a part of my life with people and breaking down the misperceptions of blindness with my videos. I think that no matter what you have going on, whether you have a disability or not, if you want to try something take that leap and give it a try you might just surprise your self and find something you love to do. This post was great!! Your photographs are amazing! Thank you, you are so sweet ! Thank you ! Glad you liked it ! And my guide dog Rick is very cute ha ha, I might be a little biased ! Aww! that’s adorable. I bet he is a great pal!